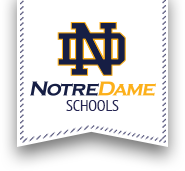 The Notre Dame Skills Camp is designed to provide campers with personal attention to advance their basketball fundamentals. Under the direction of Notre Dame Basketball Staff, our emphasis will be placed on individual improvement and fundamentals. We have assembled a great staff of college coaches and players who will instruct you during the week. The object of the camp is to learn while having fun regardless of age, sport experience, or skill level. You will be grouped with other campers with similar athletic backgrounds in the same age group. The individual instruction you will receive will be in small groups and supported with demonstrations and analysis from the coaching staff. Summer is a great time to play sports, meet new friends and enjoy different adventures. If you want to learn more about basketball and do so in an exciting environment, then this is the camp for you. Register now and get in on the fun!